The word “blazer” conjures visions of powerful women marching down a busy street in the financial center of some big city in a rich country. They look put together, all business, a certain air of impatience that they have to walk down this busy street, and the blazer. They wear blazers with shoulder pads as if to carry the weight of the world of very wide shoulders. These visions come to me from a distant past, some 80s composite of all the powerful women in movies and TV shows. No wonder I have never owned or sewed a blazer. And then more recently, from another corner of my memory, came a vision of a punk rock icon wearing a blazer. At first, I could not pinpoint the source of this memory. I did not know if this was a real memory or something I created. The more I tried to remember, the more difficult it got. 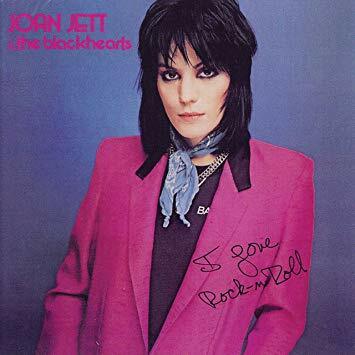 And as how things like this go, the moment I walked away from my effort to remember, there the memory was: Joan Jett and all her jet black hair glory on the cover of I Love Rock’n’roll wearing the coolest hot pink blazer that has ever been worn. 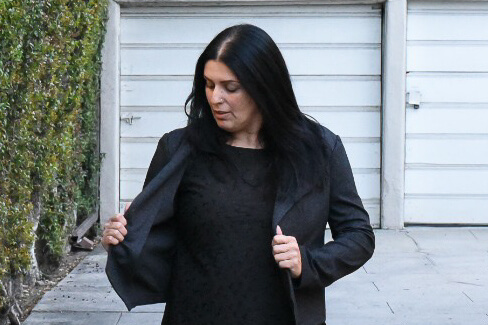 If a blazer is good enough for THE Joan Jett, it is good enough for me. Just not hot pink; that, I cannot pull off. It was this image that I appeared in mind when I first saw the Morris Blazer by Grainline Studio. The Morris is just so cool. 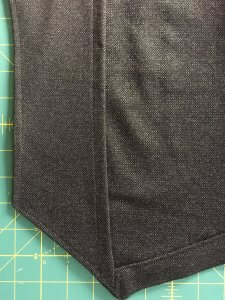 A comfortable, stylish blazer that can be sewed out of ponte fabric? Sign me in! The Morris seems like just the right amount of challenge—a blazer made out of knit and its fitting forgiveness with a very modern look and a sew-along to go with it. The final sign that this was meant to be came when by chance I came across the paper pattern for sale on Amazon for a discounted price (the discount is no longer available). I ordered the pattern and through the magic of Prime, I got it in two days (yes, I know how damaging Amazon is too small businesses, and I do my best to stay away from it, but if we must have a future Overlord, at least this one delivers in two days). I have found that Joann has some pretty decent ponte de roma. I have a few Hollyburn skirts made out of ponte purchased at Joann, and they have taken wear and tear well. There was a good sale on knits at the time of my visit, and I bought three years of tweed ponte. The fabric is really nice, thick and warm, perfect for colder days and nights in Los Angeles. Tweed is one of those super classic choices for outwear, and for my very first blazer, I wanted something that would fool-proof. This ponte was easy to work with even if pressing was somewhat of an issue. I ended up using a pressing cloth as I did not feel that a hot iron would make the fabric happy. I read about other sewists’ experience with the Morris, and I decided on the bare minimum for adjustments. Since the pattern is drafted for a B-cup, I SHOULD have done an FBA, but I was feeling lazy. 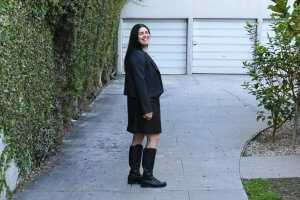 Besides, the blazer is meant to be worn open (there are no buttons), so I took my chances. 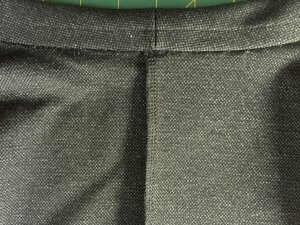 I cut a size 16 for the shoulders and graded to a size 18 from the waist. As I am not a big fan of ¾ sleeves, I added to their length. I briefly considered a muslin, but I decided to sew dangerously for a change. For those who need a good review of the Morris, What Katie Sews has a great article about the blazer. The instructions that come with the pattern are very thorough, but the Grainline Studio sew-along was the most helpful tool as I sewed the Morris. The first steps are really simple, but things get progressively more challenging. The most difficult steps are adding and attaching the facings. I messed up and forgot that I had cut a size 18 for the hem. When I tried to attach the hem facing to the hem, it obviously did not work. Luckily, I had more fabric than what the pattern required, and apart from the pain of having to cut a new hem facing, unpick the facing, and sew it again, once the right size was in, everything matched perfectly. 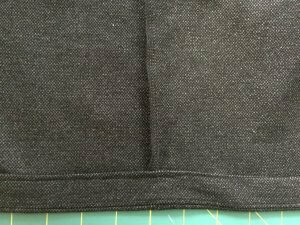 I chose to hand-sew the hem facing as sewing it with the machine did not allow me to get an even distribution of fabric bulk. Hand sewing is slow, but the level of fabric control that it allows is well worth its time-consuming nature. I feel like a grown-up person with my Morris blazer. I am still trying to figure out how to style it, but I think that it is an exceptional first effort—especially since it was done with a muslin or fit adjustments. The shoulder seams hang a tad low and maybe for my next Morris. Next time, I will try to bring it closer to the shoulder hinge. I want to try a stretch woven for the next one, and since wovens are not as forgiving, I know there is a Morris muslin in my future. I want to goth it out with a nice black sateen and lace details for the collar. Or who knows? Maybe I need my own Joan Jett-inspired hot pink blazer. Uuh, can’t stop looking at the lapel details – those hot, sharp corners you made!! Your plan for the next one sounds so yummy, sateen + lace is always a winning combo, I’d love to see that!